Any issues not covered by these published rule sets will be addressed on a case-by-case basis by the CIRC Organizing Committee. Rules are subject to change without notice. Please submit any questions that have not yet been addressed to the CIRC Organizing Committee at [email protected]. The most up to date rules will always be posted on the website. Rules will be updated to properly reflect questions and concerns raised by participants. 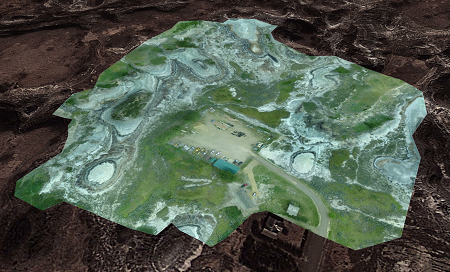 KMZ files are provided below to teams to use as a supplement publicly available aerial maps. Google Earth Pro is recommended for opening and viewing this file format. The files are GPS referenced, however CIRC can not offer any guarantee of accuracy for navigation purposes. Additional point-cloud formatted data (with more vertical detail) may be provided closer to the event. The 2018 Canadian International Rover Challenge (CIRC) will be held from August 10-13, 2018, around the town of Drumheller, Alberta. Teams must arrive in Drumheller and sign in to the work facility before 18:00 on August 10. The first night challenges will begin the evening of August 10. Competing teams must consist of university students (defined as being enrolled at least half-time in a degree or diploma program). Teams may have faculty or industry advisors, but advisors are required to restrict their involvement to academic advising (e.g. no direct design or material assistance). Teams will operate their rovers from base stations (e.g. a metal trailer or opaque tent) provided by competition organizers near each task site. Alternatively, teams may bring their own tent or trailer to the site, subject to organizer approval at each task site. These stations will obstruct the operators’ view of the task. Power (120V, 60Hz) will be provided at the command site of each task for the purpose of powering teams’ communication and control equipment. During the competition, teams must store and work on their rovers at a central location provided by the competition organizers. Testing areas are available for use nearby. Teams are encouraged to interact with each other and the public, but are expected to behave in a fashion which reflects well upon their institution and the competition. The location will be accessible by teams 24 hours of the day, and open to the public during business hours. Entry into the 2018 Canadian International Rover Challenge is limited and subject to the approval of the organizing committee. Teams should submit a formal expression of interest using a form available on the CIRC website in order to be considered. Selected teams must pay the registration fee of $200 CAD to confirm their spot in the competition. Fees are nonrefundable. Rovers will be subject to inspection by CIRC organizers at sign-in on August 10 as well as at any time during the event to ensure safety and rule compliance. Teams must address any issues raised to the satisfaction of the CIRC organizers before beginning or continuing a competition task. Teams are responsible for ensuring that all the components and subsystems of their rover will be permitted entry into Canada. Information regarding border crossings can be found on the Canadian Border Services Agency website (http://www.cbsa-asfc.gc.ca/menu-eng.html). If in doubt, teams should make arrangements to purchase substitute parts in Canada before the event begins. Teams may submit appeals regarding task scores within one hour of receiving notification of their score. Appeals must be submitted in writing to [email protected] and include supporting evidence such as video footage. Organizers will review the evidence and respond as soon as possible. The team which earns the most points in total during the competition shall be declared the winner. No UAV platforms may communicate with the rover or rover operators, or be used to aid completion of rover tasks. All teams which choose to use UAVs must understand and comply with all Canadian aviation regulations and local law. CIRC takes no responsibility for teams’ actions regarding UAVs. A guideline is available under Team Resources. Scoring rubrics can be found here. Teams must bring a rover which is a single mobile self-contained ground vehicle. Rovers must begin each task as a single unit with a mass of not more than 50 kg. A penalty of 20 points will be applied for exceeding this limit. The rover should be portable by two team members without the use of a cart. For every full kilogram rovers are below 50 kg at task weigh-in, teams will receive a 1% bonus on points earned in that task. The total mass of the rover and all modular/detachable major components (such as arm, shovel, etc.) must not exceed 85 kg. A penalty of 20% will be applied to all points earned throughout the entire competition for exceeding this limit. Replacement parts are not included in this restriction. Rovers may be expected to operate for up to 60 minutes. At least 60 minutes of downtime will be provided between tasks. Rovers must be capable of operating within the terrain and weather conditions which may naturally occur during a competition task, including rain, mud, darkness, etc. All rover systems must be suitable in concept for operation on Mars (e.g. no open-system pneumatics, etc). However, the rover components themselves are not required to be space grade. Rovers must have an easily visible and accessible kill switch which physically disconnects all rover power supplies. Absolutely no combustion-based processes, explosives, hazardous or flammable liquids or gases may be carried by the rover, except within a permanently sealed component such as a battery. Rover communications systems must comply with all applicable Industry Canada Regulations (http://www.ic.gc.ca/eic/site/smt-gst.nsf/eng/h_sf06128.html). Teams intending to operate in restricted bands are responsible for acquiring the necessary permissions and qualifications. Any team found to be operating equipment in contravention of these regulations, or in a manner which maliciously interferes with other teams’ activities, will be immediately disqualified. The use of interference-tolerating protocols (and cooperative interference resolution between teams) is strongly encouraged. Line of sight between the base station antenna and rover is not guaranteed for any task. A suitable antenna mount will be provided for teams who do not have their own. The specifications for this mount will be provided at a later date. Antenna towers will be limited to a height of 4m. Teams with towers that have tower over 4m in height will be restricted from participating until their tower meets the limit. Rovers are not required to operate autonomously, however tasks may award additional points based on the degree of autonomy demonstrated. Teams shall be required to submit a final expense report by August 1, 2018. If necessary teams may submit an updated soft copy during sign-in at the event. This budget includes all rover components and base station equipment exclusive of personal computers. It does not include replacement parts, tools, or travel expenses. Gift-in-kind donations and sponsorship count towards the budget at fair market value unless an exception has been provided by the CIRC Organizing committee. Teams may be required to submit documentation as proof of the budget items upon request including the value of donated or gift-in-kind sponsorship. Teams may use the most advantageous currency conversion rate documented between October 1, 2017 and August 1, 2018. Teams are required to use the CIRC specified template for expense reporting, which can be found here. Task site judges are the final authority on task rules, scoring and penalties. The lowest score achievable in any task is zero. Teams will have 15 minutes of setup time before starting the task, and 15 minutes of takedown time after ending the task. Teams’ task time begins when the setup time expires, regardless of whether they are ready. Teams which have not cleared the task site by the end of their takedown time may be penalized at a rate of 1 point per minute. Teams should be prepared to work in the dark for the Search and Rescue task. A maximum of two team members will be permitted to accompany the task judge following the rover during tasks. Any number of team members may remain within the base station or spectate from outside the task area as defined by the judges on site. Team members who have been outside of the base station during the task may not communicate with the those in the base station. If the rover must be manually reset (e.g. loss of communications requiring repositioning), rover operators or the team members in the field may call for an intervention. After an intervention has been called, the rover shall be returned to the starting point of the task before continuing with the task. A 5 point penalty will be applied for each intervention. In the event that the rover creates an unsafe situation or travels outside the task area, the task judge may call an intervention by activating the rover’s kill switch. In this case, the team must rectify the cause of the situation before continuing. During an intervention, the team members in the field must carry the rover back to the starting area. Other team members may leave the operator’s station as necessary to carry out the needed repairs. However, any team members who leave the operator’s station will not be permitted to re-enter. Any communication between team members inside the base station and members who have been observing the event from outside of the base station and/or accompanying the rover constitutes calling an intervention. Any communication regarding task specifics between those in the base station and those outside of it will result in a penalty of 20 points. This task calls for the use of the rover as a scientific instrument. The ability of the rover to explore, measure, and document; and the ability of the teams to interpret and report on their results, will be put to the test. Prior to the event, teams will be provided with aerial photographs of the task area. Eight possible sites of interest within four zones will be noted in the photographs, and approximate GPS coordinates provided. Select four sites of interest (one from each zone) from the candidate sites. If teams find an unlisted site which holds particular interest or significance, they may substitute it for one of their pre-selected sites. Take a panoramic photograph of the site. Take a photograph of the feature with an indication of scale. Record the precise GPS coordinates of each site. Select one of the visited sites for further study and carry out measurements of any conditions the team considers useful or illuminating. Measurements may be executed either by the rover at the site, or on the recovered sample at the base. Measurements at the base may be performed after the task ends. Any tests which involve adding or applying any foreign substance to the measurement point must be performed on isolated samples, and cannot contaminate the site in any way. Collect a sample with a total mass between 5 and 100 grams from the chosen site. Return to the starting point with the sample. A header identifying which team wrote the report. An overview of the team’s plan and approach to the task, including target site selection and routing. Properly explained maps and/or diagrams (e.g. legends, descriptive labels, orientation) are encouraged. If an unlisted site was selected, it must be fully justified at this stage. Failure to properly justify diverting from the exploration plan will result in no points being awarded for work at the unlisted site. A list of interesting or significant observations about each site. An explanation of why the site was chosen to carry out the experiments. A complete explanation of the experiment(s) performed, including the apparatus, the method, and the applicability of the technique(s) to the task. A summary of the results of the experiment(s) and the significance thereof. Properly explained tables and figures are encouraged. The task area, and any forbidden areas, will be marked and specified via GPS coordinates. The aerial photographs will also indicate these areas. The sites of interest will not be physically marked in the task area; teams will be required to identify them using the photographs and coordinates. The established outpost requires a continuous supply of various resources. These resources can be processed from local soils and sediment. Collection of such resources is tedious, repetitive, and not a good use of the skilled individuals at the outpost. Teams are to develop rovers that can reliably collect, transport, and return the sediment to a central location for processing. Travel to three different locations. Collect resources (sediment) at each of the three locations. Return the sediment to a central receptacle. Teams must return to the resource receptacle before proceeding to the next resource location. Whether teams collect resources or not, during the initial completion of all task legs, they must return to the receptacle before proceeding to the next leg of the competition. After the initial completion of each leg, teams may return to the sediment sources in any order they wish. Teams cannot return sediment from two sources at one time. Teams must return to the receptacle to deposit sediment from each source separately. Teams do not need to collect the full amount of sediment from each source in one trip. Teams can return to each sediment source multiple times in an attempt to collect the maximum amount of sediment. Teams can return to the sources after attempting other legs of the challenge. The path to each sediment source may not be direct. Teams may have to navigate obstacles and challenging terrain to reach the sediment sources. Teams may not have a direct line of sight to each leg of the challenge. Teams may be provided with GPS-defined areas the rover may not enter. Sediment will be loosened by organizers to ensure consistency among all participating teams. Sediment will be piled above grade, however teams may dig below grade if they wish. Sediment composition and material type is not precisely specified. The maximum sediment to be scored is 4 kg from each source. Any mass beyond that does not increase task score. Teams are not expected to collect 4 kg prior to attempting further activities. All points of interests such as mining locations and the receptacle will be marked by tennis balls, and GPS locations will be provided. The rovers will all start in an orientation arbitrarily set by the judges. The receptacle will be a rectangular prism with an open top. The receptacle opening will be 30 cm above ground level. The receptacle opening will be 60 x 90 cm. The tasks are completed using full teleoperation. Teams may drive the course, record navigation information, and complete as many challenges as they desire at level 1 scoring. Teams then attempt to complete two consecutive actions where the rover operates without any user input. The operators must tell the judges when they are starting a level 2 attempt on tasks. The next interaction with the rover will constitute the end of the attempt. Teams must complete an entire leg of the task without operator input in order to achieve this level. The rover must start the level 3 attempt at a position and orientation near the receptacle as instructed by the judges. Teams can only achieve this level of scoring if no prior attempts of any kind have been completed. Every action must be completed sequentially from the very beginning. Any interaction with the rover after starting ends this run. All other action beyond that point will only qualify for level 1-3 scoring. For sediment to count as collected, teams must intentionally collect sediment through their collection mechanism. Simply having sediment on your rover does not qualify. For sediment to qualify as returned, teams must return at least 50 g.
Rovers must deposit the majority of the sediment they are carrying in order to earn points for the “Empty into hopper” action. “Drive to location” points, teams must drive to within 1.5m of the defined marker. Teams only earn points for the highest attained challenge level. For example: If teams complete the first leg at challenge level 1, and later complete it at level 3 parameters, they will only get the level 3 points. Teams can earn up to nine points from each resource collection site for the mass returned. One point for a returned mass in the range of 500 g - 1 kg. Three points for a returned mass in the range of 1 - 2 kg. Five points for a returned mass in the range of 2 - 3 kg. Seven points for a returned mass in the range of 3 - 4 kg. Nine points for a returned mass above 4 kg. Teams should provide estimates on the mass delivered to the receptacle. Estimates that are within 20% of the delivered mass, will receive 2 points. Estimates that are within 5% of the delivered mass will receive a total of 6 points. This includes the 2 points for achieving accuracy within 20%. For teams attempting the level 4 difficulty, the rover software must compute and output these values autonomously. To receive points for the estimate on delivered mass, a minimum of 500g must be delivered. An offline remote mining station needs to be re-activated. Your rover is sent to assess and perform start-up procedures. The rover will flip a switch to turn on the electrical system. The rover will connect to a 2.4 GHz 802.11g wireless network which will allow rover operators access to the mining station’s diagnostic information. The diagnostic information will provide clues on the status of the station’s systems and what needs to be done to bring them online. Turning a ball valve 90°. All items that the rover must interact with will be no higher than 1 m above grade level. A time bonus of one point for each full minute will be awarded for fully completing the task before the time limit. The actions can be completed in any order. If the team chooses to forfeit the points for opening the maintenance panel, the task judge will manually open the panel so subsequent actions may be attempted. A user manual with equipment specifications and diagrams for the mining station is available for testing in advance of the competition. The sample diagnostic system for the Equipment Servicing task can be accessed at task.cstag.ca. To use it, send a single UDP packet containing ASCII text to port 4547 and you should receive a similarly formatted response. Try HELP to begin with. The LOGIN command needs a username and password, which for this test sample are MTECH and GITRDONE. Send an email to [email protected] if you can’t get this working. Command has lost contact with a scientist operating in the vicinity of your rover during the night. We suspect their suit has been damaged and they may have been incapacitated. Your rover operations team is tasked with aiding the rescue effort. Move to the scientist’s waypoint, provided as GPS coordinates. Locate the scientist by homing in on their distress signal. Stabilize the casualty using emergency supplies carried by your rover. Mark the location by activating a strobe light beacon. After each intervention, the rover must drive from the Starting Area to the scientist’s waypoint before proceeding to the Casualty. Teams will be provided with the following Rescue Supplies: one mock Oxygen Cylinder; one Strobe Light Beacon; one roll of generic Duct Tape. The mock Oxygen Cylinder is approximately 6 cm in diameter, 30 cm in length, and below 2 kg in mass. A male threaded fitting approximately 3 cm in diameter and length extends from one end. Part of the threaded fitting will be marked red. The strobe light beacon is a cylinder approximately 8 cm in diameter and 5 cm in height, and is activated by a small switch mounted in the center of one end. Rescue Supplies may be loaded onto the rover while it is within the starting area. This may be done during the setup period or task time. The Oxygen Cylinder and Strobe Light Beacon may not be modified. Rescue Supplies may be manually recovered during an intervention. The Duct Tape may be substituted for other suit patching equipment provided by teams at judges’ discretion. Due to environmental considerations, no liquids or loose material such as powders are permitted. The specifications of the distress signal to be received by the Radio Direction Finding system may be found at this link. The distress beacon signal will be pulsed on and off at a frequency between 0.5 and 5 pulses per second. Falsifying RDF system output will result in a score of zero for the entire task. Teams must not cause additional harm to the Casualty. Rough handling will result in a forced intervention. All artificial lighting used for navigation and completion of the tasks must come from the rover. Team members following the rover may only carry low-power, directional flashlights pointed downwards to avoid tripping. Team members must keep their distance from the rover and must not aid the rover operators in locating the Casualty. Forced interventions or score penalties will be assessed for interference. Subtasks may be completed in any order, but note that completing the Activate Beacon subtask ends the task. If teams are unable to locate the astronaut after 15 minutes of task time, they may forfeit the points for “Reach Casualty Location” and “Report Casualty Location”. Depart Start Area: The entire rover must leave the Starting Area under its own power. Reach Scientist’s Waypoint: The rover must come to a halt within 5 m of the provided GPS coordinates, and the rover operators must report the rover’s position to the judges. Demonstrate RDF Function: Rover operators must describe the principle of operation of their Radio Direction Finding system, and explain the resulting output visible at the operator’s station. Judges may instruct the rover operators to perform simple operations or maneuvers to evaluate the performance of the system. Judges will assign a score based on the quality and usability of the system’s displayed output, as well as the sophistication of the approach. Multipath signal propagation is expected. To earn full points, the system should employ some method to identify and disregard signal echoes. Reach Casualty Location: The rover must come to a halt within 5 m of the Casualty, and the rover operators must show the judges the rover’s view of the Casualty. Report Casualty Location: Rover operators must write down their best estimation of the Casualty’s exact GPS coordinates on the score sheet. Points will be awarded if this is within 5 m of the coordinates measured by the organizers. Report Casualty Status: The chestpiece of the Scientist’s suit displays two pieces of status information. Additionally, there is a small tear on the surface of the suit marked with red paint. Points are awarded for reading each piece of status information and visually locating the tear on the suit. Activate Suit Backup Comms: There is a toggle switch located on the Scientist’s chestpiece labeled “Backup Comms.” Flip the switch to the ON position. Patch Suit Leak: Apply a piece of the Duct Tape or other approved patch material to the tear in the Scientist’s suit. The tear will be less than 5 cm in length, and will be visible and reachable without moving the astronaut. Full points will be awarded if the entire tear is covered and conceivably airtight. If the patch covers only part of the tear, or it is not securely attached, judges may award ⅓ or ⅔ points at their discretion. No points will be awarded if the patch is not applied to the area of the tear, or if it falls off of the Scientist’s suit before the end of the task. Alternative patch material must approved by the task judge anytime prior to the initial departure of the rover from the starting area. Either on the ground, on top of the Scientist’s suit, or suspended in midair by the rover’s manipulator arm. Attach Oxygen Cylinder: Points will be awarded if the Oxygen Cylinder is screwed into the vertically-oriented threaded fitting on the Scientist’s chestpiece such that it does not fall out before the end of the task. Full points will be awarded if the cylinder is screwed in far enough that the red marking on the threads is no longer visible to the judges. ⅔ points will be awarded if the red marking on the threads is still visible. Deliver Beacon: Points will be awarded if the Strobe Light Beacon is stationary and upright on the ground within 5 m of the Scientist, and not in contact with the rover. Activate Beacon: Push the button on top of the Strobe Light Beacon to activate the flashing light. Once the beacon is intentionally activated, task scoring ends. Time Bonus: If the Activate Beacon subtask is completed, additional points may be awarded based on the amount of unused task time remaining. If more than ten but less than twenty minutes remain, ½ of the Time Bonus value is awarded. If more than twenty minutes remain, the full Time Bonus value is awarded. The Rovelympics are an optional series of short tasks to be performed after the competition is over prior to the event wrap-up. Rovelympics events are scored, however the results do not affect team’s official competition standings. The Rovelympics are intended to be a fun event for everyone to see the rovers in action. All teams are encouraged to suggest possible challenges to be included. Q: Prospecting: what is the criteria of interest? Are we looking for sites that would be the best places for a settlement? A: The challenge is structured to emulate an early settlement. Teams will be required to defend their selection in this context. The significance of a site may stem from several factors, such as potential for acquiring unique scientific (especially geological or biological) data, deposits of useful and/or valuable resources, or suitability for expansion of the settlement (though defending one particular site within the event by this condition will require careful thought by teams). Q: Resource Extraction: Is the location or number of the tennis balls on the receptacle known? A: There will be a single tennis ball mounted in the center of the top edge of the receptacle, on the side of the receptacle facing toward the main part of the task area. The tennis ball will be yellow and the same as the ones used to mark the dig sites. We will distribute pictures once the receptacle is built. Q: Search and Rescue: Will the structure of the astronaut be similar to a human in hardness? A: The outer layer of the astronaut patching area will be loose fabric with some give. Underneath this there will be a firm, heavy object which will hold the shape of the suit. Q: Equipment Servicing: Can the connection to the 2.4 GHz network occur from our base antenna, instead of the rover itself? A: No, the rover must make the connection and pass the information back to the base station. Teams should show evidence to the judge that this is happening. Q: Search and Rescue: Could the Duct Tape be substituted for a hot glue gun, or would that count as ‘liquid’? Q: Search and Rescue: Are there any provisions in case of accidentally hitting the ‘activate beacon’ button prematurely? A: Teams may either attempt to deactivate it using the rover or call an intervention before proceeding. In this case points will not be awarded for activating the beacon until it is deactivated and later activated intentionally to end the task. Q: Search and Rescue: What are the characteristics of the distress signal? A: The transmitter is very simple: it simply outputs a sine wave at around 434 MHz. We are not using it to transmit data. Instead, the amplitude of the signal will go between a lower level and a higher level at a constant rate which we do not tell you. The signal should not be difficult to detect at the expected position of the rover. Q: How much time can we expect for each task? A: We will allow 60 minutes of driving time for all tasks except Search and Rescue, which is 45 minutes. Additionally we will allow 15 minutes of setup time before starting the task, and 15 minutes afterward to clean up. These times are subject to change if necessary. Q: Are we allowed to drop our equipment from the rover and leave it until the task’s end? A: This is okay as long as the rover starts in one piece and you clean everything up before the next team’s time starts. Q: Will there be an opportunity to visit the task sites before the competition? A: No, as this is incompatible with the concept of a remotely operated Mars rover. We will provide detailed terrain maps for planning purposes.